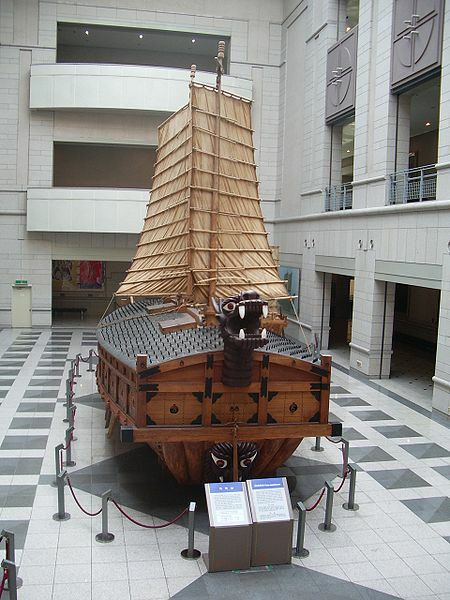 The Turtle ship, also known as Geobukseon(거북선), was a type of large warship belonging to the Panokseon class in Korea that was used intermittently by the Royal Korean Navy during the Joseon Dynasty from the early 15th century up until the 19th century. The first references to older, first generation turtle ships, known as Gwiseon (귀선; 龜船), come from 1413 and 1415 records in the Annals of the Joseon Dynasty, which mention a mock battle between a gwiseon and a Japanese warship. However, these early turtle ships soon fell out of use as Korea’s naval preparedness decreased during a long period of relative peace. Turtle ships participated against Japanese naval forces that supported Toyotomi Hideyoshi’s attempts to conquer Korea from 1592-1598. Korean admiral Yi Sun-sin is credited with designing the ship. His turtle ships were equipped with at least five different types of cannon. Their most distinguishable feature was a dragon-shaped head at the bow (front) that could launch cannon fire or flames from the mouth. Each was also equipped with a fully covered deck to deflect arrow fire, musket-shots, and incendiary weapons. The deck was covered with iron spikes to discourage enemy men from attempting to board the ship. Claims that it was iron-plated remain controversial (see section on decking). This entry was posted in Korean History by admin. Bookmark the permalink.